It has been requested that this article be rewritten. Reason: needs to be split in sections. Star Roads debuted during Super Mario World. These are stars on the map that connect various points in Dinosaur Land to Star World. They are placed to provide shortcuts across the world, though beating all of Star World's levels is necessary to get the full effect of their shortcut-oriented purpose. All the Star Roads can be found by beating a level with a second exit. 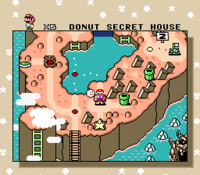 If the player goes to a Star Road in Star World without beating the level in Dinosaur Land that leads to it, the road will be showing on the map but Mario or Luigi will not be able to move forward towards the unbeaten Dinosaur Land level (in Valley of Bowser however, Mario or Luigi are able to reach Bowser's Castle this way). Red and green blocks must be activated to fully use them. Mario and Princess Toadstool rush to a Star Road, as seen in the Super Mario World cartoon episode "King Scoopa Koopa". Though never named, Star Roads made at least two appearances in the Super Mario World cartoon. In the cartoon, they had the exact same purpose as they did in the game; therefore, Star Roads could warp people to Star World (or "Star Path", as it was called on the show) and only appeared alongside Star Path itself. 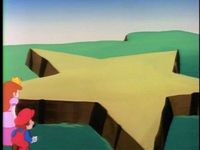 The cartoon depicted Star Roads as large, star-shaped slabs of yellow stone found on high cliffs; the only major difference between the Star Roads of the game and those of the show were that the ones seen on the show lacked eyes and did not stand upright. The fact that both Star Roads featured in the show were seemingly found on the same cliff may indicate that they were the same Star Road, or perhaps even suggest that only one Star Road existed in the show. However, the former is more likely, as both Star Roads were shown to be near (or perhaps within) the limits of Dome City. Most of the Star Roads on the Star Path itself (save for one seen in the episode "King Scoopa Koopa") were replaced with Warp Pipes; "King Scoopa Koopa" shows that these Warp Pipes act as the ending areas of Star Roads while the separate episode "Send in the Clown" showed the landing point of the Star Roads as a possibly varying area on the Star Path, and both episodes show that the Warp Pipes have the same purpose of connecting areas in Dinosaur Land that their Star Road predecessors possessed in-game. The debut of Star Roads in the cartoon came in "Send in the Clowns", where Mario, Luigi, Princess Toadstool, and Yoshi used a Star Road to access Neon Castle through Star Path, and they had their second and final appearance in "King Scoopa Koopa", where Mario and Toadstool (as well as a group of cavepeople-turned-Chickadactyls, including Luigi and Yoshi) used a Star Road to slow down a wild pursuit. In Mario Sports Mix, the Star Road also appeared as the Star Cup's alternate route. If players complete missions during the road, then it will become a big star for players to jump through, sending them back to the normal tournament for the final match. This page was last edited on November 29, 2018, at 19:43.